Occupation: 8 confortables hébergement-9 partagés au maximum! La famille de l'entrepreneur maison construite en 2007 donnant une piste cyclable qui serpente à travers Kailua Beach Park. Pas de circulation ... nous sommes à la fin d'une voie 7 de la maison. 250 pieds de la plage à travers la pelouse du parc. Voisins tranquilles - nous cherchons les mêmes locataires. Cinq chambres. Trois chambres à l'étage: chambre principale dispose d'un lit king size, salle de bain privée; chambre 2 a un lit queen; 3 chambres à coucher a un lit complet (Couchage une). Chambres 2 et 3 partagent une salle de bain complète. En bas: chambre 4 dispose d'un lit queen; 5 chambre a un lit queen et une entrée privée à la cour. Chambres 4 et 5 partagent une salle de bain complète. Piscine cour a une cabane avec douche et salle de bains. Grandes vérandas ... une dans la cour arrière, un seconde véranda de-chaussée donnant vue sur l'océan. Parking fermé allée; propriété entièrement clôturé et privé. Poulet de résident Petite reste sur la propriété. Qwner peut besoin d'un accès garage. Marché historique et la Kalapawai Steakhouse Deli et Buzz sont à 2 minutes à pied sur la piste cyclable. Shopping dans le centre Kailua un mile de distance comprend Macys, Longs Drugstore, Whole Foods, Starbucks, Safeway et bien d'autres. Kayak vacances à un pâté de propriété. L'heure d'arrivée est 16 heures et l'heure de départ est 10 heures. Kailua Beach Park / piste cyclable façade. Beach se trouve en parc pelouse. The house and location were both perfect! Between the awesome white sand beach and the great pool we hardly used our cars. Cliff was a great host who’s only concern was that we truly enjoyed our stay and we did! Perfect home base for Oahu sightseeing. Spectacular day trips to Pearl Harbor, Wakiki and North Shore. But, no reason to go anywhere with Kailua's amazing beach and a BEAUTIFUL home with easy access to bike path, cute shops ans shave ice in walking distamce and a nice pool and yard. Very well kept. Fantastic location. Beautiful home. All necessary amenities. This is the perfect house. It is very well maintained and in a perfect location, next to the Kailua Beach Park. The house is beautiful and contains all of the necessary amenities. Cliff and Shawna were very easy to deal with; they were unobtrusive but when we needed them they were very responsive. We were 3 families (6 adults and 3 children - 4 to 9) and found the house to be extremely comfortable. We highly recommend this house. Beautiful home and lovely owner's. This home is in an excellent location we couldn't have picked any better. My experience at the home was lovely my experience in Hawaii was not so great! the last night at the house my 5yr old tripped over a suitcase and hit the door edge and spent a few hours in the morning getting stitches, and most of us were sick the entire trip sadly! but this house itself is gorgeous. We will stay here again when back in Hawaii. Great house, great location and a great owner to rent from! I organized a trip for a group of 9 people, including 2 families and a set of grandparents. When we got there, there was an unexpected lack of gas to heat the water, so we didn't have hot water for the first day. However, Cliff (the owner) was all over it... he had it fixed within 24 hours, and after apologizing profusely even gave us a bit of a credit back for the trouble. As we settled in and sorted out our plans for the week, Cliff was always available to answer questions, ensure we were aware of the amenities and equipment they had at or near the house. The house itself is in a fantastic location... is right on the Kaliua Beach Park, where it is a 2 min, quiet walk right over to the beach. The location also provides super easy access to downtown Kailua, and you can order instacart for grocery delivery and organize a cleaning service to come in mid week if you want to. All in all, this was a fantastic vacation, partly thanks to the great house and location, and partly due to Cliff's support and attention during our stay. I would definitely go back again! Great Location across from Kailua Beach Park. Slept 8 comfortably. Our family celebrated my husband's birthday by surprising him with a family reunion in Kailua. The house was great for the 8 of us. We loved the spacious rooms, the beautiful floors, the gorgeous staircase, and the gated driveway. Cliff even gave a tour of the property to my daughter who lives on the Island before we actually booked. Cliff and his wife are very accommodating. It was lovely working with them. 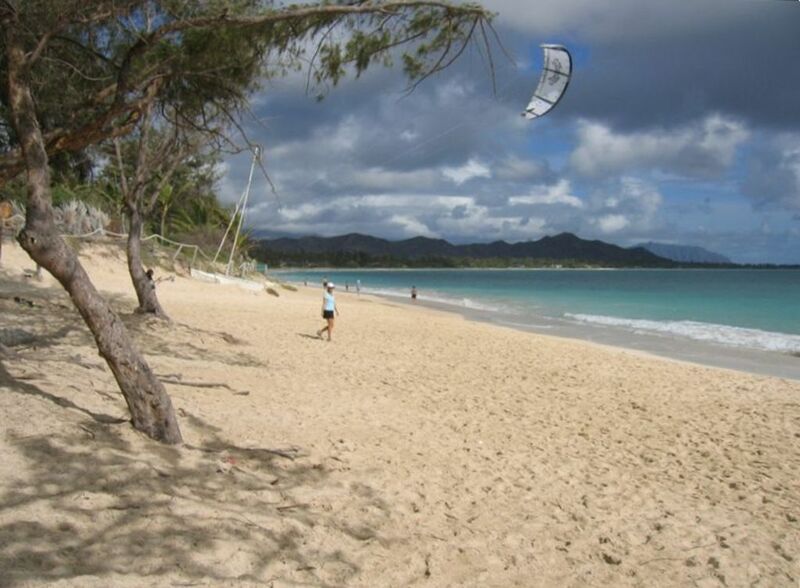 Being able to walk to beautiful Kailua beach was a joy and the highlight of our days. The kids loved the pool. The pool with a great sitting area/furniture and an oversized picnic table was perfect for our large group. There is also an outdoor shower and toilet area by the pool. The house boasts beautiful floors and spacious rooms and bathrooms. Each of the 5 bedrooms have air conditioning but we only used it in one bedroom on one night; otherwise the house stayed cool. We used the washer and dryer and dishwasher regularly. The street is relatively quiet. Cliff and his family stayed in the cottage in the back of the property while we rented the main house. They were quiet and unobtrusive. No worries there. The driveway is gated and we parked both our cars in the driveway. The house is situated on a dead end street so there is little to no street traffic. We gave this a 4 star because the house amenities could use some updating; mostly kitchen/bathroom/lanai items. If you have a large party, this is the property for you! We took our friendly guests' suggestions to heart and improved kitchen, bath and lanai amenities accordingly. Thanks and aloha! 14.97% tax is a combination of the Hawaii State General Excise Tax of 4.72% and the Transient Accommodations Tax (HI Tax I.D. No. W01315602-02) of 10.25% and 3% Paypal/VRBO transaction fee There is a $600 cleaning fee per period of rental. Renter is responsible for the cost of additional cleaning should your stay require additional cleaning services. Check in is 4:00 PM and out time is 10:00 AM for cleaning but is somewhat flexible depending on needs. There will be a finalized VRBO contract for signature after full payment and includes a pool addendum, and a Honolulu City and County monthly rental contract encompassing the time period reserved for you over a 30 day period (Note:this is a residential property rental requirement in Hawaii). Typically the 50% deposit and final payment once paid is not refundable, however if we find another renter to take the dates you reserved we reserve the right to refund the deposit in good faith.